The Branched Chain Amino Acids Leucine, Isoleucine, and Valine are so called because the side chains of these amino acids (the part of the molecule that differentiates the amino acids) are made up of non-linear (branching) carbon chains. 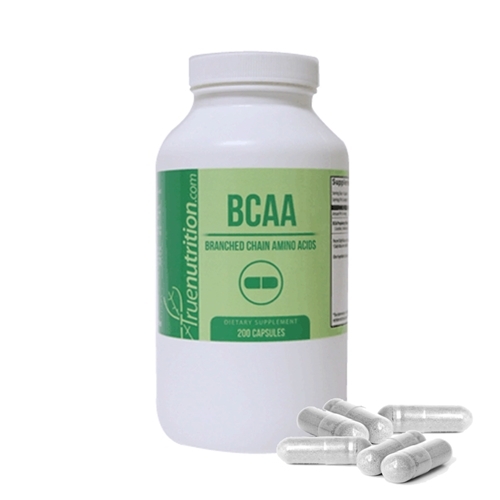 BCAAs are essential amino acids, meaning that they must be consumed in the diet (rather than manufactured in the body) and constitute more than one-third of the amino acid composition of skeletal muscle. As a dietary supplement, BCAAs help support increased muscle metabolism and increased energy production, making them an ideal recovery aid following intense exercise.✝ True Nutrition's BCAA Capsules are derived from fermented plant-based ingredients, and are entirely vegan-friendly! As a dietary supplement, take 1 Serving (4 Capsules) between meals, 30-45 minutes before workouts, and/or immediately after workouts. By far the Best BCAA supplement I have taken. Easy to consume and it definitely gives me the quality and results Im looking for. However, for 200 capsules which is equivalent to 50 servings I found out i got only 46 out of that and 1 extra capsule. I just hope on my next order the issue will be resolved and hopefully no one else runs across it.